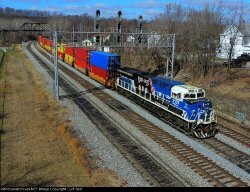 Welcome to Curt Beal's Railroad Picture Archives! Welcome to the RRPictureArchives.NET contributor site of Curt Beal. In my albums you will find a great variety of content and photographic styles. I do railroad car roster shots, engine roster shots, scenic train shots, snow and fog shots, bridge portraits, yard shots, action shots, artistic shots and many others that don't fall into one category. Though I can never please everyone 100% of the time, hopefully you all find an album that suits your taste. Newest photos are always found at the end of the albums. I want to thank everyone for over 1 million views so far. Important disclaimer: My photos uploaded onto this website are for reference/historical/documentary purposes, and for the enjoyment of the general public. The intent of the photos is not to hassle railroad employees or to try and catch them violating railroad policy. They have a very important job to do and I always respect that. Lastly, please respect that my photos are "All Rights Reserved" and may not be reposted, blogged, uploaded, or used for commercial gain on any website without my direct permission.